He was not referring to the lies found in corporate media on Aleppo, but instead to the unreported reality: foreign-backed terrorists have continued mortaring, rocketing, hell-cannoning Aleppo’s residential areas. Since his message, various Syrian news outlets and individuals have reported on further bombardments of Aleppo, as well as yet another terrorist bombing in Damascus’ Sayyeda Zeinab district, an area which has been repeatedly targeted by western-backed terrorists. “Live from the explosion scene near Sayyeda Zeinab quarter in Damascus countryside. At least 8 people killed and 20 injured. “…The driver passed through two military checkpoints and when he reached the third at the entrance of the town of Diyabiyah south of the Shiite district of Sayyidah Zaynab, soldiers demanded to thoroughly search the vehicle and that’s when the driver set it off, said the source on a condition of anonymity. “This is one of the deadliest attacks that hit Sayida Zenab quarter since the start of the unrest in Syria. But the residents here said such explosions will not stop them from supporting the Syrian army in the fight against terrorism. Bear in mind that “injured” includes many who are critically-injured, many of whom will likely add to the number of martyred in coming days [For example, see: University Hospital, Damascus: Meeting Victims of Western-backed Mortar and Rocket Terrorism, from Feb 2015 visit to Syria]. For more on the silence of western/corporate media on actual acts of terrorism against Syrian (and Lebanese, Iraqi, etc) civilians, see: Where is the West’s compassion & condemnation following terror attacks in Middle East? “Within only 24 hours, the Turkish backed terrorists showered the residential areas of ‪#‎Aleppowith 200 unguided mortars and gas jars, killing many many civilians. “Four civilians were killed and 56 others were injured when terrorists from Jabhat al-Nusra and other terrorist groups affiliated to it targeted the residential neighborhoods in Aleppo city in new breaches of the cessation of hostilities. A source at Aleppo police command said in a statement to SANA reporter that terrorists fired rocket shells on al-Nile Street and al-Mukambo residential neighborhoods in Aleppo city on Saturday afternoon, injuring 10 civilians and causing material damage to public and private properties. Later on Saturday, the source said that terrorist organizations targeted residential neighborhoods with rocket shells, killing a woman and injuring 3 in al-Iza’a neighborhood in addition to killing 3 civilians and injuring 33 in al-Ashrafiyeh. SANA report quoted a source at Hama Police Command as saying that the shells were fired from al-Jaberiyeh village where terrorists from “Ahrar al-Sham Islamic Movement” and Jabhat al-Nusra are operating. Four of the shells hit residential neighborhoods, while the other 10 fell in the surroundings of the city, which is located in the northwestern countryside of Hama, according to the source. A source at Aleppo Police Command told SANA that a woman was killed and 6 civilians were injured Sunday in shelling attacks by terrorists from Jabhat al-Nusra and other armed groups linked to it in Aleppo city. Later, SANA’s correspondent in the province reported that the death toll of the rocket and mortar attacks carried out by terrorists on residential areas in Aleppo city within the past 24 hours rose to 10. The correspondent quoted a source in the province as saying that in addition to the 10 lives they claimed, the terrorist attacks on the neighborhoods of al-Ashrafiye, Manyan, Saif al-Dawla, al-Khalidiye, Nile Street, al-Hamadaniye, and al-Mukambo injured scores of civilians and caused considerable damage to more than 100 houses, 7 mosques, 3 schools, and 20 cars. “…Jabhat al-Nusra and other armed groups affiliated to it targeted with rocket shells several residential neighborhoods in Aleppo city on Monday. A source at Aleppo Police Command told SANA reporter that three of the shells fell in al-Sulaimaniyeh neighborhood, claiming the lives of 3 children and injuring 17 people, some of them are in critical situation. 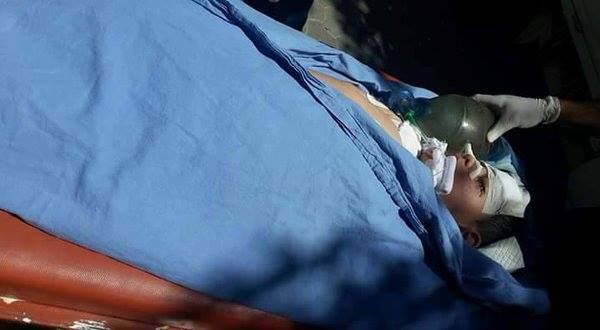 19 more civilians were injured by a number of shells that hit al-Izaa (radio) neighborhood, according to the source. Two other shells hit Bab al-Faraj neighborhood and Qurtuba roundabout in al-Zahraa neighborhood, injuring 2 civilians. “Yesterday, 24 April, 2016, a little girl fell victim, among many others, to the cruel and barbaric bombardment of the peaceful government controlled neighborhoods in City of Aleppo by Erdoghan’s Turkey terrorists. In the photo a single shoe and breakfast left behind by the angel little girl. Eva Bartlett: Canadian activist/freelance journalistst. I’ve lived cumulative ~3 years in Gaza, spent time in Lebanon and visited Syria 4 times since April 2014. Anti-zionist, anti-imperialist, pro-justice.